The American Association of State Highway and Transportation Officials (AASHTO) recently named its annual America’s Transportation Award winners at the 2018 Northeast Association of State Transportation Officials (NASTO) conference, and two JMT projects were recognized. 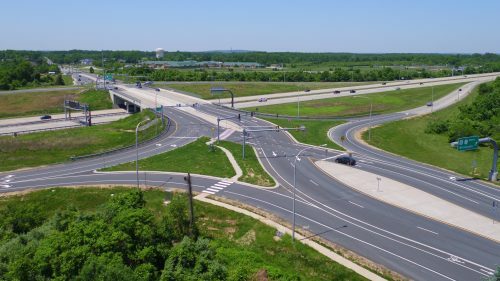 The MD 404 project with the Maryland Department of Transportation won in the Quality of Life/Community Development Projects category, and the SR 1/SR 72 Diverging Diamond Interchange with the Delaware Department of Transportation won for Operations Excellence, small category. With only 18 months to complete the whole project, and only one construction season to work with, constant communication was required between contractors, design firms, MDOT and State Highway Administration, state agencies, elected officials, and the community and traveling public. In the end, the MD 404 project made the road safer for all drivers, especially providing more peace of mind during the busier summer months. JMT designed the western segment of the new four-lane divided highway as well as all the geotechnical design for the entire length of the project, approximately 11.3 miles. Our team also provided roadway, maintenance of traffic, and phasing design; structure design; hydraulic design; stormwater management, drainage, and erosion and sediment control design; wetland mitigation design; landscape architecture design; and construction phase services. As lead designer for the SR 1/SR 72 Diverging Diamond Interchange, JMT was responsible for coordinating all the engineering disciplines and executing the design and QA/QC program. We met the aggressive, fast-tracked schedule by using a rolling design package submittal process that allowed certain elements to progress early. While many DDIs are built as new interchanges, the project at SR 1 involved, essentially, a retrofit of an existing interchange while maintaining traffic, which is one reason why the project was put on a fast track. This interchange reconfiguration was needed to address the expected population growth in the area and associated roadway system improvements, as well as driver and pedestrian safety. The DDI addresses these needs by allowing vehicles to enter and exit SR 1 without having to cross lanes of oncoming traffic, which also decreases congestion.